Something’s Brewing - Experiencing steady growth since its founding in 1994, Highland Brewing Company has built a multifaceted operation that engages both beer aficionados and the community at large. Highland keeps growing its community connections to fun runs and other initiatives. On the Sunny Side - In keeping with the company’s sustainability ethic, Highland now sports one of the largest solar-power systems of any US brewery. Sit and Sip - The shaded, ground-level deck is a favorite spot for regulars at the brewery. Hands On - Ashburn pitched in last year to make a special collaborative beer, with Asheville Brewing Company, to benefit the Pink Books Society, an international effort to support women’s roles in the industry. The company’s slogan is changing from “A Wee Bit Different”: Highland will now tout itself as “Pioneers in Craft” and “Asheville’s Original Craft Brewery. “Wee” No More - Highland now has some 50 employees, including Jamie Rowe, the company’s head brewer. “A wee bit different”—Highland Brewing Company’s original slogan remains apt in some ways, even as the flagship Asheville brewery expands, evolves, and sheds its Scotsman logo in a new rebranding campaign. How different? Consider the company’s origins, for starters: Unlike most craft breweries, Highland was founded by an engineer (not a brew aficionado) in a basement (not an industrial-chic warehouse) as a distributor (not a tasting room). Opening in 1994, it became Asheville’s first post-Prohibition brewery. But perhaps what makes Highland most unique today is the woman running it: Leah Wong Ashburn. “It wasn’t new for Highland to have a president that’s not a brewer, but it’s unusual to be a second-generation, female, non-brewer” in this role, Ashburn says of the position she assumed in 2015. Even her look—impeccable posture, lustrous black locks, and broad smile—is a far cry from the stereotypical flannel-clad male mien associated with most of her peers. But for Highland, the brand of “different” Ashburn brings is just right. Ashburn’s tenure with the company was initially a case of sliding doors. When her father, Oscar Wong, began the business, Ashburn was in her early 20s and eager to join his team—but he rebuffed her. Instead, she pursued a gratifying corporate career in Charlotte, working as a representative of yearbook companies to teach the tenets of journalism to students and teachers. In 2011, Ashburn left behind the corporate ladder for the family biz, working first as a sales rep then in marketing before becoming Highland’s vice president and then president. Since taking on her father’s former role, Ashburn has dedicated herself to maintaining the uniqueness of the brewery, even as she molds it to reflect her own values. Among those values is sustainability, an ethos that’s echoed in Highland’s very structure. The brewery’s solar array is the third largest among US craft brewers and the 13th largest of any brewery in the world. In its event center, there’s live-edge oak furniture harvested from the Highland grounds and, hidden from view, a water reclamation system installed by Ashburn’s husband, Brock Ashburn, who serves as Highland’s vice president of operations. Ashburn’s commitment to environmental stewardship is an expression of her love of the land, which is apparent through other facets of the brewery, like the rooftop patio, where imbibers can take in Highland’s brews with a view. Weekly run and bike clubs encourage fans to get outside, and the annual Night Flight Race, held each summer, raises funds for local greenway efforts. The list of Ashburn’s innovations keeps growing: The interior of the tasting room recently received a revamp, for example. Meanwhile, the composition of Highland’s staff is shifting as Ashburn cultivates a hiring process that intentionally seeks out character over expertise. And even the beer is evolving, as the brewers begin to experiment with bretts (beers with wild yeast) and barrel-aged brews. The biggest change, however, is to the brewery’s brand. 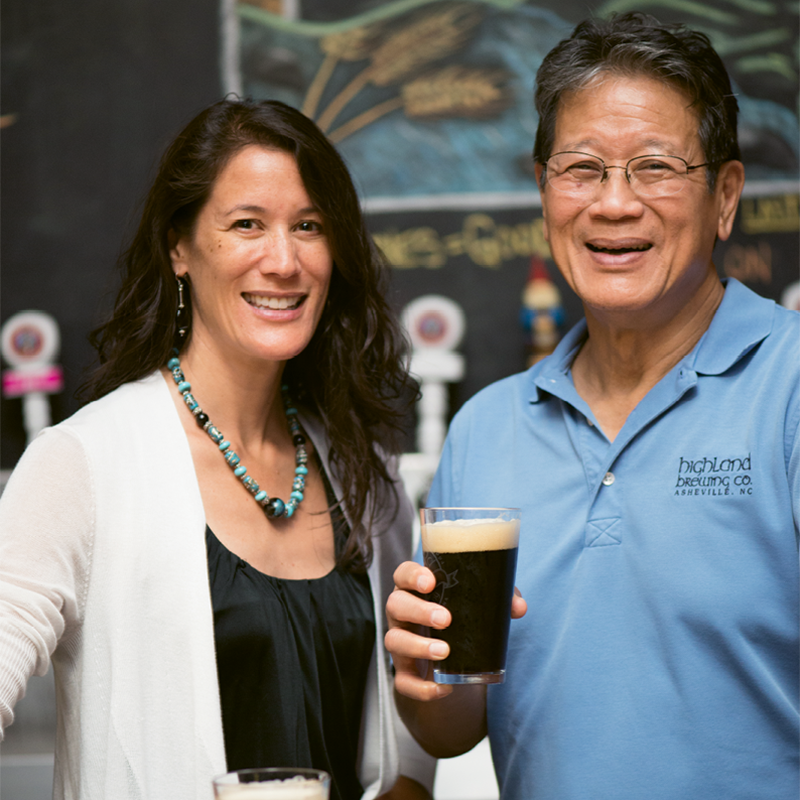 Revealed in February, the new face of Highland Brewing Company is a product of extensive research and forethought. After a series of surveys conducted across three distinct populations—people unfamiliar with Highland, regular customers, and employees—it became apparent that it was time for a change. Ashburn recruited Austin, Texas-based Helms Workshop (a creative agency with plenty of experience in the beer sphere) to create new visuals that embody Highland’s spirit. The result is new branding with one foot solidly in the tradition of the brewery, with the other stepping firmly into 2018. “We’ve had the same brand since ’94 and it has served us very well. The core remains: We were inspired by the Scots-Irish heritage in the area, so the name stays the same,” Ashburn says. The new logo—a simplified, stylized compass and “H”—epitomize Highland’s pioneering leadership and authenticity. The company’s slogan is changing as well: Highland will now tout itself as “Pioneers in Craft” and “Asheville’s Original Craft Brewery.” And in truth, the expiration of the old catchphrase seems fitting: Under Ashburn’s nimble leadership, Highland is a lot more than a “wee” bit different.